120 Raspberry Pi & PiTFT Cluster at resin.io « Adafruit Industries – Makers, hackers, artists, designers and engineers! So, testing was the core motivation for building what we affectionately call “The Beast”. 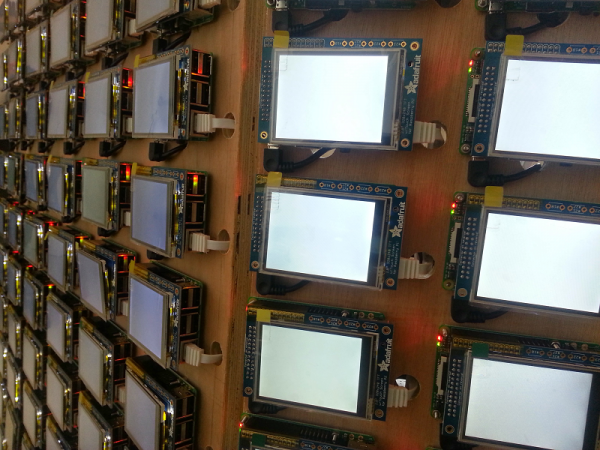 120 Raspberry Pi, each with a 2.8″ Adafruit PiTFT screen, all mounted on a wood panel in a somewhat eye-pleasing format. Behind the panel, we mounted 10 USB hubs, and 10 Ethernet Switches. A Corsair CX750 power supply unit completes the beast.